Each year thousands of hunters take to the deer woods to plant their food plots. The options or varieties of seeds to plant are endless. Our food plot goal is to provide attractive forage for deer so they will return to the plot all season long. This makes patterning deer easier. Some varieties of plants tend to attract deer better during specific times of the fall, like corn and clover. To increase the odds of patterning a mature buck we prefer to plant a fall blend called Broadside. This blend is comprised of four different seed varieties, soybeans, wheat, turnips, and radishes. All of these selected species have a specific roll throughout the fall and winter. As a new, tender sprout soybeans are highly attractive to deer. So the purpose of the soybean is to attract deer during the early season when the soybeans are the most palatable. These soybeans are not intended to produce pods, but to provide a high quality nutritional food source as the rest of the stand establishes itself. Once the soybeans are browsed down, this makes way for the wheat to thrive. Under the right conditions wheat can grow and add serious tonnage to the plots. In our region wheat will continue to grow through much of the winter even when heavily browsed. This makes wheat an important addition to the mixture. As the cooler temperatures begin to set in the turnips and radishes then become highly attractive to deer. Deer will browse the green tops of the turnips while the bulbs and tubers grow in the soil. When old man winter comes to town the explosion of wheat, turnips, and radishes will keep the deer coming back for more. 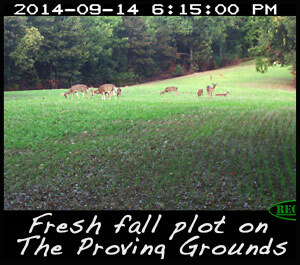 We plant this blend in our plots each year and deer follow the same cycles each season. The Broadside blend serves as a time released food plot throughout the hunting season. The plot produces an attractive food source throughout the entire fall. It is important to never clean the table and not offer food in your plots. If your plots are barren, then the local deer herd will be seeking an alternative food source. This could be your neighbor’s food plot! Keep your food plots growing and attractive this fall, hopefully you will be feasting on venison and not tag soup!